(CNN) -- Top sprinter Mark Cavendish's hopes of retaining his Madison title at the world track championship in Pruszkow, Poland were thwarted in dramatic fashion after Great Britain team-mate Peter Kennaugh was involved in a heavy crash during the race. 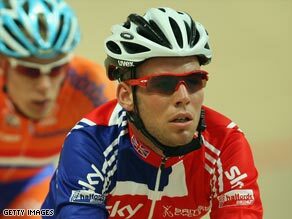 Cavendish was left disappointed in his attempts to retain his Madison world title. Cavendish, who again proved he is the fastest sprinter in road racing with victory in last weekend's Milan-San Remo Classic, went into the event as the reigning champion having triumphed in Manchester 12 months ago alongside Bradley Wiggins. And the 23-year-old and fellow-Isle of Man rider Kennaugh had high hopes of another gold medal medal in the sprint discipline on Saturday. However, with Britain third in the points total and only the Czech Republic a lap ahead, Kennaugh flew over the handlebars following a mistake by Colombia's Juan Esteban Arango Carvajal with 64 laps to go. Kennaugh's bike was split in two and he required a replacement before gamely carrying on. Cavendish, who also won the title in 2005 in partnership with Rob Hayles, rejoined proceedings -- one rider in the partnership is in the race at any one time -- but the British duo were shaken and went on to finish down in sixth place. Denmark claimed the title, with Australia second and the Czech Republic third. There was some consolation for Great Britain when Victoria Pendleton successfully defended her women's sprint title. Pendleton, the Olympic champion, progressed untroubled to the final but lost the second of the best-of-three sprints to Dutch opponent Willy Kanis. However, the 28-year-old clinched the title in the deciding race following a photo-finish, her fourth sprint gold medal in five years.